Scroll Down Below the MGM Signature MLS Listings to Read MGM Signature Fast Facts, HOA Dues & Fees Info and Watch Signature Videos. Contact The Stark Team to get started in your condo-hotel buying search in the Signature at MGM Grand Towers. 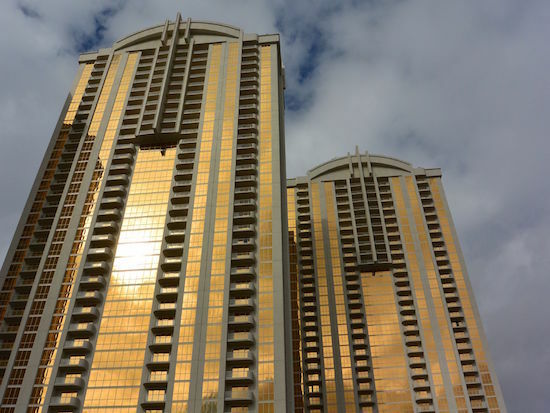 We have sold all 3 MGM Signature towers from paper ( pre-construction). Our Expert Buyer Representation is at No Cost to You! We can explain the ins and outs of the MGM Signature & other rental program options. Undoubtably, these are the most popular Las Vegas Hotel-Condos. Odd numbered MGM Las Vegas Signature condos face the Strip. Penthouse are located on floors 29 & up. These have ceilings that are an extra foot high and the elevator buttons for these condos are labeled “PH”. The Signature studios are all 520 sq. ft.
No mountains side ( east facing) studios have balconies. Studios ending in 05, 07, 15, 17 have balconies. On floors 29 through 38, the penthouse floors, if a studio ends in 09 and 11 also have balconies. One Bedroom Mgm Signature Las Vegas condos all have balconies and a half bath, that has a shower. The corners are 874 sq. feet and the non corner one bedroom stack is 847 sq. feet. These non corner1 bedroom condos are located on the east side of the tower ( mountainside – Top Golf facing) and adjacent to the elevator core. The tower addresses are 142 E. Harmon Ave, 135, and 125. 145 is Tower A or Tower 1 and was the first to be built, and closest to the Mgm Signature Studio Walk which takes you to the MGM Grand Hotel & Casino. 135 is the center tower, 125, closest to Harmon Ave. and the newest. Tower A has a Starbucks in the lobby as well as an owners lounge. Tower B has a Del. All have their own fitness centers. All are connected to the MGM Hotel via the studio walk. All Parking is Valet only. There are two sets of HOA dues. One is for the entire property – which is GUARD GATED. This is a minor fee of around $100 per year. The other fees vary per tower but are just under $1300 per month. These are referred to as “Shared Component Fees”. There is a TRANSIENT FEE charged ny Mgm Signature to all owners who rent their units out for less than a 6 month time frame. This is currently ( 2019) $200 per month for a studio condo and $250 per month for a 1 bedroom. Each MGM Signature Condo is individually metered for electricity. Owners need to set up an account with NV Energy. For internal purposes, MGM Signature Owner Services inserts a “6” in-between the floor and unit number in Tower 1, a “7” in Tower 2, and an “8” for the newest Tower 3. so unit 152o in Tower 2 is referred to as 15720. We have this STUNNING CUSTOMIZED MGM condo listed for sale. Owners who participate in the Mgm Signature Rental program are required to carry an insurance policy with $1 Million Liability Coverage. F, F & E fees are taken out of nightly rental income for all Mgm Signature Owners who participate in the rental program. We have a sample Mgm Signature Rental Contract that we can e-mail you upon request.